I am regularly asked to recommend trees for around a swimming pool. Most people ask for an evergreen tree. I would like to make an argument for deciduous trees. Remember that although trees may be evergreen they do drop the old leaves and grow new ones and this is an ongoing process throughout the year, while a deciduous tree drops all its leaves in a short space of time. I think it is better to cope with the leaves for 2 or 3 weeks until the deciduous tree is bare. Most people do not swim in winter and the shade is not essential during winter when the tree is bare. Choosing a tree with pretty bark or good architecture adds another dimension to the winter garden. Come spring when we are ready to jump in the pool the tree starts shooting and we have that lovely shade tree in the pool area. If you have an evergreen tree you will have to contend with some leaf drop in the pool throughout the year. Another important issue is root systems. It is obviously better to have a tree with a non-aggressive or fibrous root system, but this can be subjective as things like soil type and structure can affect whether the roots stay near the surface. Having said all this the distance away from the pool we want to plant the tree is also critical not only for the root system but also for shading the pool and making the water cold. Try and keep your trees a minimum of 2 meters away from the pool. If this is not possible make sure the tree you use has non-aggressive roots. You could also use a product called ‘Bio Barrier’ to keep the roots away from the pool. The texture of the leaves on an evergreen tree is important. If you plant a tree which has small, thinly textured leaves they are not a problem as most of them disintegrate before they fall, unless the crown of the tree hangs over the pool when they will, indeed fall in the pool but should not cause problems. The seeds however can be an issue if the tree hangs over the pool. Remember flowers can also be quite a problem in the pool for the same reasons as the leaves. It is better to stick to small or thinly textured flowers. Most trees flower for a relatively short time and you may feel it is worth it to cope with the flowers in the pool during flowering time for the rewards of the beauty of the flowers as well as the many birds and butterflies that they attract. Here is the list. Click through to Part 2 - 5 for descriptions and more details. Hi Monique, Could you possibly send us a pic of your area of the garden? ([email protected]) Before recommending a tree, we would need to know whether your garden gets frost, whether the area is heavily shaded by the wall or if it bakes in the heat, and also how narrow the area is. The roots may be fine, but you don't want to compromise on the shape of the canopy by it leaning away from the wall too much. If you don't have a problem with heavy frost, and the area gets an average amount of sun, then perhaps you could try pruning up Euclea natalensis, or Diospyros whyteana. 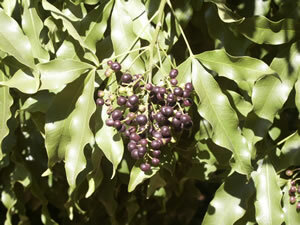 In fact the Diospyros is pretty frost hardy and doesn't worry too much about sun or shade. It is quite slow though, so put plants in that are already quite established. About 40 to 100L bags. For more suggestions we would need a bit more information, and if you are near enough, it's well worth popping in to see the trees at our nursery. You are also welcome to give the nursery a call on 082 553 0791 (William) for further assistance. I am looking for a tree to plant in a narrow area next to a boundary wall near our swimming pool. I like the look of Ficus hillii, but apparently it has an aggressive root system. I would like a tree that would complement a contemporary garden. Do you have any suggestions, please?